Splitting up your off-duty time in your United States log book. This is mostly for team drivers but single drivers can do it as well. The key to understanding how to split up your off-duty time in the USA log book is understanding the pattern. Once you understand the pattern, it's straightforward. My kids watch a cartoon called Umizoomi where they present a pattern and then they get the kids to guess the next shape in the pattern. Kids have a great time doing it. So think of this as an advanced Umizoomi. Learning how to split up your off-duty time in your USA log book. Splitting up your off-duty time in your USA log book. Mostly for team drivers, but single drivers can do it as well. The first stipulation about splitting up your off-duty time in the United States is that you must have a sleeper berth unit on the back of the truck. You can't do it with a day cab - must be a sleeper berth; must be an approved sleeper berth unit in order to split up your off-duty time in the United States of America. It is rigid in splitting up the 10 hours. It must be split up into one 8-consecutive hour block...8-hour consecutive block rather ,and a two-hour block. 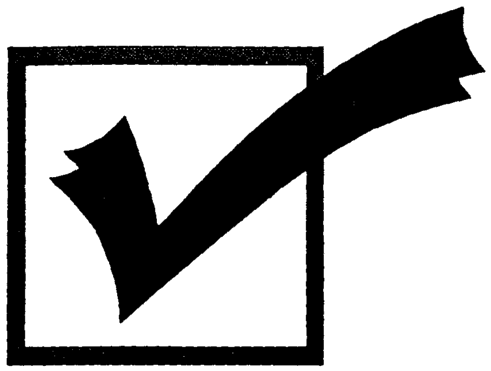 The only concession of splitting up your time in an American log book, is is that you no longer have to take the 30 minute break that is required when you're running a straight ten consecutive hours off duty at or before the eight hours. That's the only concession in splitting up your off-duty time. What is a little bit confusing for most is understanding the 14-hour window, because the 14-hour window moves depending on when you take your eight hour or you take your two hour break. It's easier to think about it in terms of the 14-hour window as a twenty two-hour window when you take your eight hour break and a 14 hour window when you take your two hour break because the eight hours off-duty doesn't count towards your 14-hour window. So essentially, the eight hours off-duty, you take that and add that to your 14 hour window. So if you start in the morning at 7 a.m.—14 hours is 9 p.m.—you don't count your eight hours so you get another eight hours, so 9 p.m. is to 5 a.m. So you're 14 hour window extends out to 5 a.m. Because essentially you don't count the eight hours. You see here on the log book we started at seven o'clock in the morning—we worked for three hours—we drove for four hours—which put us at 2 p.m. in the afternoon. At 2 p.m. in the afternoon we took eight hours off. So essentially, we're working in a 22-hour window from 7 a.m. to 5 a.m. the next morning because we took eight hours off-duty. So our 14-hour window extends out to 5 a.m. the next morning. You can see on the log book here we take eight hours off from 2 p.m. to 10 p.m., because we've already driven four hours, we can drive another seven hours from 10 p.m. to 5 a.m. At 5 a.m. we must take another two hours off from 5 a.m. to 7 a.m. When we take the next two hours off we now have a 10-hour block from the previous eight hours and the two-hour block. So now our 14-hour window moves forward to the end of our most recent 8-hour block. As you can see here on the log book, which is ten o'clock at night. And because it's the two-hour block is counted in our 14 hours, it's 10 o'clock at night to noon is our 14-hours. So essentially from 5 a.m. to 7 a.m. we take off in the sleeper berth. Because we've already driven seven hours, we only have another four hours, so if we start driving at exactly 7 o'clock you can drive to 11 a.m. and then you cannot drive any longer, but you can work until noon. But you can only drive another four hours because you're up against and 11 hours. Now if you just stop driving at 11 a.m. and don't work any farther. You take another eight hours off, now your window‚Äî because it's the a 8-hour block—is a 22-hour window and starts at 7 a.m. in the morning. So essentially your window, you're working time, extends to 5 a.m. the next morning. So that's the pattern. Everything else applies - you can find the basic log book here. The course on 11 hours and the 14-hour window. 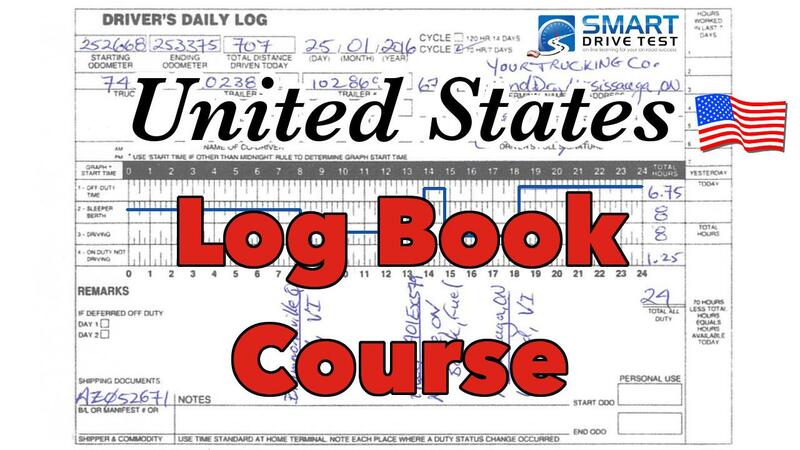 Basic rules of driving for log books in the United States of America. And you need to think of it as that pattern: you come on-duty - if you take your first break as your 8-hour break, it's a 22-hour window. And then you take your second break of two hours - the two hours is included in the 14 hour window, so at the end of that first eight hour break, its 14 hours. In the example we used, we started driving at ten o'clock at night. The 14-hour window, which includes the two hour break, takes you up to noon the next day. When we stop driving at noon the next day, our 14-hour window resets to the end of the two-hour block, which puts us into a 22-hour window because we don't include the hours in the 14 hours. We simply add it on. So 7 a.m. to 5 a.m. the next day is now our window of working time, and in that twenty two-hours we can only drive 11 hours. The other thing that I will say about splitting off-duty time in United States of America-if you're running team, the two log books must dovetail. What I mean by dovetail is if one person is taking eight hours off in the sleeper berth, the other person better be off duty as well or driving. Both drivers cannot be driving. 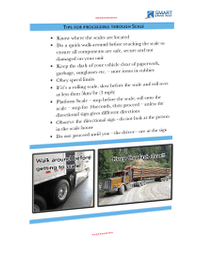 So make sure that when you sit down at the truck stop or the rest area, or wherever you're sitting down to do your log books, the two log books dovetail. 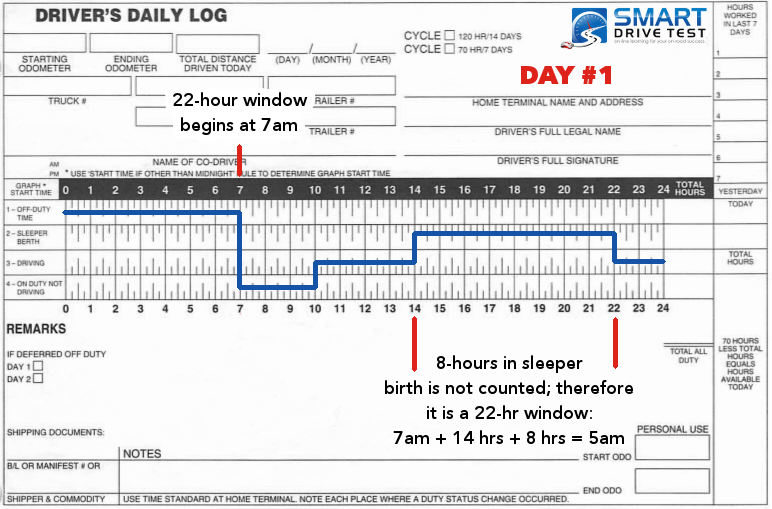 Make sure that the two of you are not driving at the same time, because that will lead to violations on the part of the authorities if they're looking at your log books and they find out that the two of you are driving at the same time or you violated the 11 hours and the 14 hour window... the 11 hours of driving or you've exceeded the work hours. So keep all of that in mind. You got to recognize the pattern. If you recognize the pattern, this is fairly straight forward. The best way to think of splitting your off-duty time in terms of the eight hours off-duty and the two hours off-duty: if the eight hours in the 14 hour window, it's a 22 hour window because you take the 14 hour window and add the 8 hours to it. If it's two hours, the two hours is included in your 14 hour window, so the end of the eight hour period— forward 14 hours, so if you start driving at ten o'clock at night, which is the end of your eight consecutive hours on duty, that's when you start driving, it's a 14 hour window to noon the next day and within that fourteen hour window or the 22 hour window—if you've got an eight hour break in there—you can only drive a maximum of 11 hours. 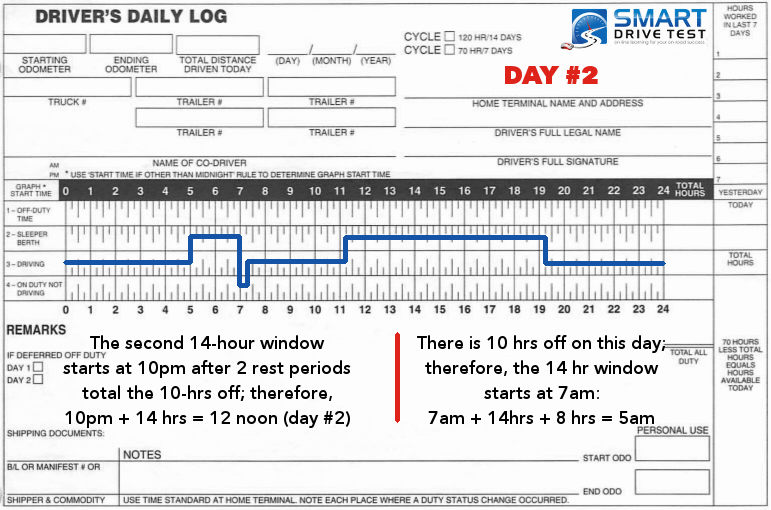 Team drivers, make sure that your two log books are dovetailing. Not exceeding all of the other rules - the 11 hours in a 14 hour window or twenty two-hour window - you're taking the 8-hour break, in that window or the 70 hours in 8 days. And make sure that the two log books dovetail - that the two of you are not driving at the same time. That's how you split up the logbook time in United States of America.